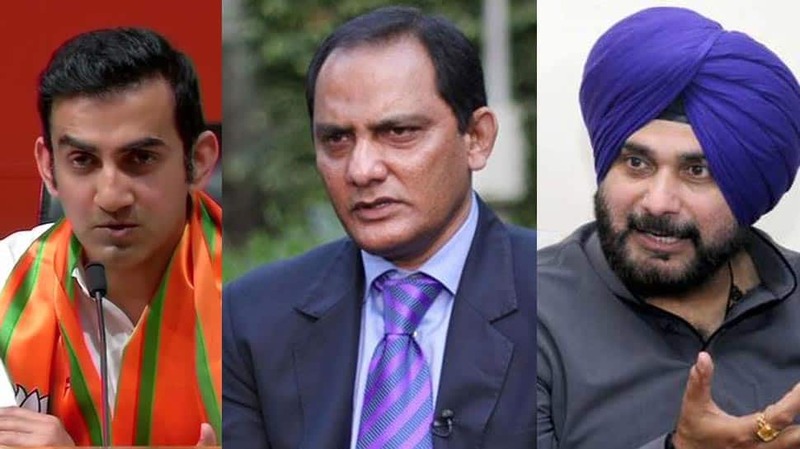 Former international cricketer Gautam Gambhir on Friday joined the BJP following the trail of several cricketers who joined politics after retiring from their cricket career. The 37-year-old is expected to be fielded in the Lok Sabha polls from one of the seats in the national capital. Gambhir joined the party in the presence of Union ministers Arun Jaitley and Ravi Shankar Prasad. The former opening batsman played a key role in India’s triumph in the 2011 World Cup and the 2007 T-20 World Cup. He was recently conferred upon the Padma Shri award. Gambhir said he was impressed by the vision of Prime Minister Narendra Modi and will work for the country’s welfare as a member of the party. He is not the only cricketer who launched a new career in active politics. Navjot Singh Sidhu: A politician mired in controversies, Sidhu’s political career started when he won on a BJP ticket from Amritsar seat in the 2004 Lok Sabha election. In the 2009 general election, he again won from the same seat but he was not nominated from the seat in 2014 general election. In 2016, he took an oath as a member of the Rajya Sabha but he resigned in July 2016. He along with several others had formed a new party called Aawaaz-e-Punjab. However, in January 2017, Sidhu joined the Congress and contested from the Amritsar East in the Punjab Assembly elections in 2017 and he won. Mohammad Azharuddin: The former captain of the Indian cricket team, Azharuddin had joined the Congress party in February 2009. He won the 2009 Lok Sabha election from Uttar Pradesh’s Moradabad to become an MP. He has revealed his intention to contest the 2019 election from Secunderabad seat. He is currently holding the position of the Working President of Telangana Pradesh Congress Committee. Azharuddin’s career came to an end after he was implicated of match-fixing in 2000. Kirti Azad: A former Indian cricketer, Azad had joined the Congress in February 2019. He is the son of former Bihar chief minister of Bhagwat Jha Azad. He is currently serving his third term in the Lok Sabha. Earlier, he was elected to Parliament on a BJP ticket from Darbhanga, Bihar and had won the 2014 elections from Darbhanga. He was also an MLA from Gole Market constituency in Delhi. In December 2015, he was suspended from the BJP for accusing Union Finance Minister Arun Jaitley over alleged irregularities and corruption in Delhi’s cricket body Delhi and District Cricket Association. The zenith of his cricket career was that he was a part of the Indian team that won the 1983 World Cup. Praveen Kumar: Ahead of the 2016 Uttar Pradesh polls, cricketer Praveen Kumar had joined the Samajwadi Party (SP) during the tenure of CM Akhilesh Yadav. Chetan Chauhan: A member of the BJP, he was twice elected as an MP from Uttar Pradesh’s Amroha seat. Chauhan was a member of the Lok Sabha from Amroha in 1991 and 1998. However, he lost the election from the constituency in 1996, 1999 and 2004. He finished fourth on the last occasion. He is a member of the Bharatiya Janata Party. Since August 2018, he is a minister for youth and sports in Uttar Pradesh. Vinod Kambli: He joined the Lok Bharati Party and was appointed a vice-president of the party. He contested the 2009 Assembly election from Vikhroli, Mumbai but lost the election. Mohammad Kaif: He had joined Congress ahead of the 2014 election. He contested in the election from Uttar Pradesh’s Phulpur and lost to Keshav Prasad Maurya of the BJP.